Let’s not worry too much about why I was in Ibiza. Not really my kind of place I’d always thought, until it turned into exactly my kind of place by virtue of the bargain airfare and the promise of some winter sun. Still not really my kind of place I thought as we exited the airport past posters for clubs featuring DJs called things like XXXMixx and not Disco Dave. But then it turned out that none of the clubs opens much before May, which means that for five or six months of the year Ibiza gently rocks to a more traditional Balearic beat. That week in March, the weather held at a steady 70 degrees, with the beaches largely deserted and Ibiza old town still shuttered against the winter squalls. There were few tourists in the local market, while buses out to the outlying villages carried schoolkids and grandmas – sailing past the out-of-town super-clubs like Privilege, whose gates were firmly locked, last year’s posters unfurling from the billboards. The trees were full of oranges; hidden courtyards opened up off white-painted streets; castle ramparts marched across piercingly blue skies, while a gentle ocean breeze ruffled slopes of wild oregano. True, some bars and restaurants were closed this early in the year, but those that were open tended to be the more traditional ones in any case. We were the only people eating breakfast pastries in the square – it might be 70 degrees, but the locals are firmly of the opinion that March is just too early to be sitting outdoors, so every table inside was full. Full of people wearing coats, buttoned-up against the 70-degree winter chill. In a rowdy tapas bar at night, we were also clearly in a minority of two – the only tourists to be seen, but welcomed with good humour as we struggled with the menu. Buses run from the main town out to everywhere you’re likely to want to see, which – to be fair, beyond the beaches – doesn’t make for a big long list on Ibiza. Out of ideas one day, we simply jumped aboard the next service that came along and got off at the end of the line, in a tiny one-street village with a brilliant white-painted church. Naturally, the church was locked and, equally naturally, the return bus wasn’t due for three hours, so we sat in the village’s only restaurant at a plastic table lined with a paper tablecloth and looked at each other. Lunch, as so often in a travelling life, was going to be the answer. Now at this point you’d be fearing the worst in England – and expecting a baked potato or toasted sandwich at best – but we were in the Mediterranean and it was lunchtime, and those two things are made for each other. Quickest way to die in a Spanish stampede? Get between the locals and the lunch menu. Actually, I don’t remember an actual menu being offered, just an entirely jovial but incomprehensible conversation with the waiter, followed by a succession of dishes turning up on the table, starting with a tuna salad, followed by grilled fish and fried potatoes and more salad, and ending with creme caramel. Nothing fancy, but equally all fresh from the market, entirely homemade and delivered to the table on the un-said understanding that you’re going to want three massive courses of food at lunchtime. Which luckily we did. There wasn’t a question asked about wine either, that just appeared too, because god knows how the rest of the clientele – the builders, the truckers, the office workers – are expected to operate complicated machinery, drive articulated rigs and oversee people’s finances and medical procedures without the benefit of a vat of chilled rosé at lunchtime. Finally, there were two tiny espressos and one giant brandy, or possibly the other way around – and then the bill arrived, almost as an apologetic afterthought. I love two things about this bill, which I present below. One of course being that it is so ridiculously reasonable, given that two people got both stuffed and drunk for €35.80. The other is that bears no relation to anything that was delivered to the table and eaten. It just says ‘Bar’ nine times, and the amounts seem entirely random, so I kept it as evidence should I ever need to write a blogpost about how brilliant Ibiza is. If only I could remember what the restaurant was called. Or where the village was. Or indeed how we got back to town. Details, details. 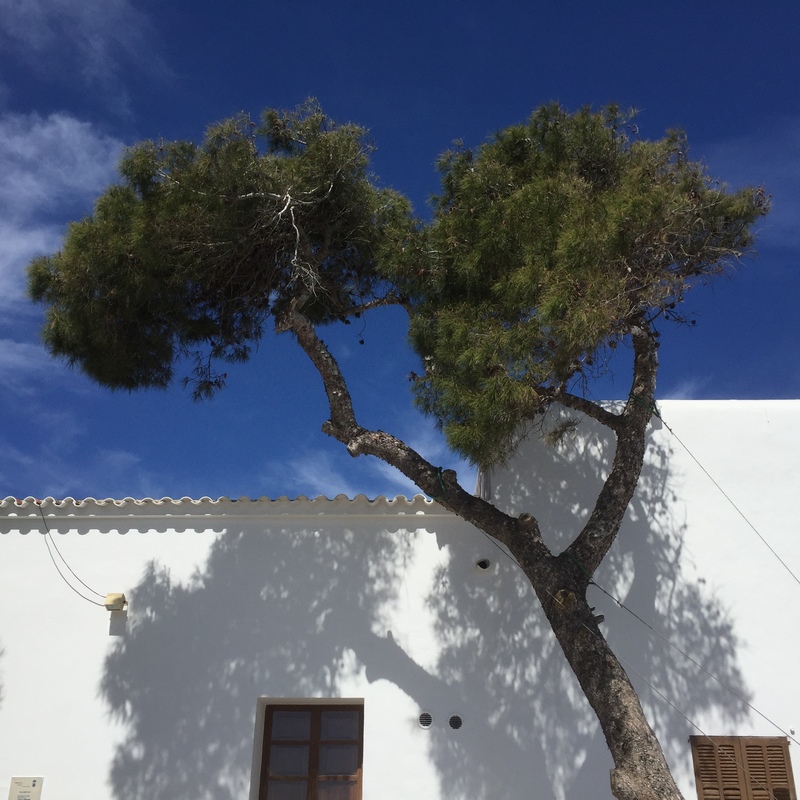 Later, I made a video called ‘Ibiza – Chilled and Blue’, because those seemed to me to be the overriding memories of a Mediterranean island just waking up for the summer, rinsing the sleep out of its eyes and getting ready for a long night on the dance floor. Like this? Read about my experiences in Mallorca in my new ebook ‘Takoradi to the stars (via Huddersfield)’ – out now and just £1.99!